This is our everyday, capture a big scene kit. The photo case is an affordable, thin, and durable case to protect your phone from parking lot drops or tree branch scratches. While our award winning lens and its aspherical design captures edge to edge clarity with almost a perfectly flat image. Available in wood or black canvas, this is for everyone who loves their camera phone. BIG FLAT IMAGE Fisheye lenses are known for curved images. Not the Moment Superfish. Instead we deliver almost a perfectly flat, 170 degree image that is sharp across the entire scene. It's like bringing a GoPro to your phone. 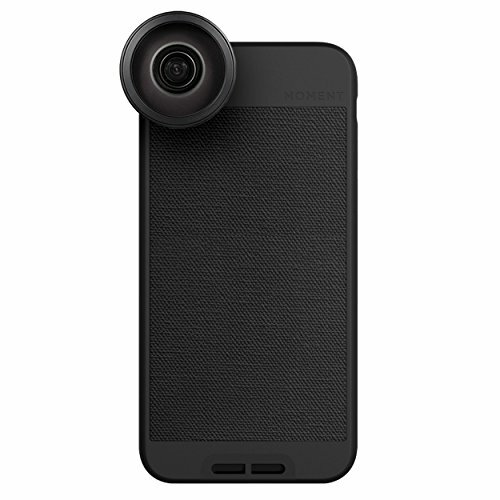 iPhone 6 (ONLY) - Photo Case plus New Fisheye Lens Kit. Our award winning lens combined with our thin, everyday case. If you love your camera phone, this kit is for you. Click on our store name for other sizes and accessories. What makes this lens uniqueâ€¦..Fisheye lenses are known for curved images. Not the Moment Superfish. Instead we deliver almost a perfectly flat, 170 degree image that is sharp across the entire scene. Its multi-element glass design provides edge to edge clarity, emulating the same field of view you would capture on a GoPro camera. What makes the Photo Case uniqueâ€¦is it combines basic protection with photography features. Its rubberized body is curved to balance protection with minimal form while providing texture for easier one handed shooting. Itâ€TMs wrist strap friendly (STRAP NOT INCLUDED) so you can drop your phone at will. And itâ€TMs lens mountable for your most important moments. Available in Black Canvas or American Wood (yes thatâ€TMs real wood). Both were selected because they provide a subtle texture to the back of your phone for easier one handed shooting. We know selfies are just as important as Instagram landscapes.